When we hear the term “economics,” we tend to think about ups and downs in the economy as well as graphs mysteriously depicting supply and demand. In reality, economics is vitally important subject because it is the study of making choices. More specifically, it is the study and practice of making choices in a world of limited resources (scarcity). You cannot go for a day without making economic decisions. For this reason, an understanding of economic thought makes you a more successful citizen. As a citizen, the study of economics makes you more calculated in your decision making. Economic decisions require that you take many variables into consideration when coming to a conclusion. In this way, it is much more scientific and mathematical than general political philosophy or simple common sense guessing. One of these variables is scarcity. Is it limited and desirable? Is there more than one use for it? Would someone pay money for it? If the answer is yes for any of the questions, the resource is scarce. By this test, almost everything can be said to be scarce. Let’s examine some examples, beginning with land in New York City. Is it limited? Certainly. Desirable? Oh, yes. Is there more than one way to use land in NYC? Of course. Do people pay for land? You bet. Land in New York City is very scarce. How about a similarly sized plot of land in rural Kansas? Is it limited? While it feels plentiful as one drives through on a family road trip, there is not an infinite amount of land. Is it desirable? Sure. Someone would be willing to pay money for land in Kansas. Are there multiple uses? Yes. Perhaps the land can grow crops, support a new subdivision of houses, or be utilized as open space for nature lovers. While land in New York City is obviously much more scarce than land in rural Kansas, we find that as a general rule, land is scarce. Furthermore, relative scarcity is reflected in the price. Land in New York City is much more expensive than a plot in Kansas. Labor is also scarce. There are a limited number of people willing and able to work, and they are certainly desirable to business owners who are interested in earning profits. Governments should also consider the opportunity costs of decisions. If the federal government decides to subsidize a solar energy company, the money cannot then be used for whatever the second best choice would be. There is more than one job a person can do. Finally, workers are paid for their efforts. As with the category of land, individual workers have different levels of scarcity. The number of people with training and qualifications to be brain surgeons is far smaller than the number of people who earned just a high school diploma, never seeking additional education or job training. Therefore, the brain surgeon will earn much more money than your average low-skilled worker because of the relative scarcities of the groups. Money is also scarce. Limited and desirable as well as useful to buy almost anything, it is an important example of scarcity. Even very rich people are faced with the condition of scarce money. Everyone must therefore make decisions about how to use money. While money is less scarce to Bill Gates than nearly everyone else on the planet, he still experiences limits. Not everything is scarce, though. A terrible disease like polio is not scarce because it is not desirable. Terribly polluted water has no uses. Garbage is also not desirable. In fact, we pay others to take away our trash. Since we live in a world full of scarcity, we must make choices. How should you use your birthday money? Which after school job should you take? Which classes should you take to best utilize your scarce time? Because of scarcity, economics as the study of choices is a critical subject. Every time a choice is made, there is a cost. A cost is what is given up when a choice is made. To an economist, there are several types of costs. The one with which we are most familiar is called explicit cost. Explicit costs are the money prices paid for goods and services. The explicit cost of a sandwich is $7. The explicit cost of a pair of pants is $35. The explicit cost of a house in Denver is $300,000. The more important type of cost to an economic thinker, though, is the implicit cost. Opportunity costs are what you give up when you use your resources. It is not the money price. Rather, it is the opportunity cost of making a decision. Opportunity cost is the value of the next best option not selected. It is not the value of every option not selected, just the second best. Only by understanding and taking into consideration the opportunity cost can we make good, thoughtful decisions. When choices are made without thinking about all that is given up, the choices are too whimsical. For this reason, good economic choices involve a close examination of benefits and costs—all the costs. Every single choice has an opportunity cost. Imagine that you go out for lunch and the restaurant has three items on the menu: a sandwich, a salad, and a pasta dish. You face scarcity of money, time, and space in your stomach, and must therefore make a choice of just one item on the menu. Your decision to order the sandwich has an explicit cost of $7 and an opportunity cost of the value of your second best choice. You don’t get to eat the salad. The pasta is not calculated as part of the cost because you never would have ordered the pasta. If the restaurant sold out of sandwiches, you would have ordered the salad. This is a very simple example. The opportunity cost of the $35 pair of pants is the sweatshirt not purchased. The opportunity cost of the house in Denver is an even larger house in the suburbs. Other choices have much bigger opportunity costs. If you decide to go to college, you will incur many costs. There will be explicit costs of tuition and books. The implicit costs are also important to consider when making your decision, though. If instead of attending classes at the closest state university, you would have attended a college on the other side of the country, you miss the opportunity to experience the educational opportunities as well as trying out living in another state. Another cost would be the money you may have earned if you got a job instead of going to college first. A popular phrase in economics is, “There is no such thing as a free lunch!” Since every choice has a cost, nothing is truly free. A person will make choices to maximize his own self-interest. The alternative with the most advantageous combination of costs and benefits will be chosen. In order to make the best choice, a decision-making model can be used to fully help examine costs and benefits. The first step is to determine the problem you need to solve. Let’s consider buying a used car as an example. Next, list the criteria important to you. This might include price, engine power, attractive exterior, and the car’s overall mileage. Some criteria might be more important than others and should therefore carry more weight in the decision-making process. You can rank the criteria, assigning a multiplier to each. Perhaps a low price is the most important feature of your car. In that case, multiply that criterion by three, for example. Having a powerful car might deserve a multiplier of two, and attractiveness and mileage might be a one. Then, make a list of the alternatives, or in this case, the main cars you are looking at. Evaluate your choices by ranking them. Give the top-ranking choice a high number and the low ranker a low number. Then, multiply the rank by the criteria multiplier to come up with a score. You can add up all the scores to make a decision. Use the acronym PACED to remember the components of the model: problem, alternatives, criteria, evaluate, decide. 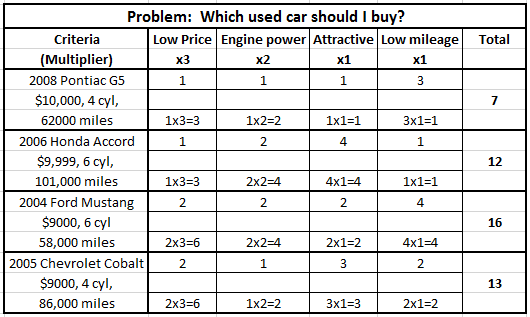 Which Used Car Should I Buy? In this case, the best car is the 2004 Ford Mustang. It has a low price, a powerful engine, and has the lowest mileage. In purchasing the Mustang, there is an explicit cost of $9,000. Admitting that it is not the best looking car, and you also give up the opportunity cost, the 2005 Chevy Cobalt. One makes the best choice by doing thoughtful cost-benefit analysis. Scarcity is a fact of life and requires that choices be made. As the study of choices, economics is a vital subject to understand so we can make the very best decisions.